What makes a good medical alert system? When should I consider a medical alert system? A good medical alert system needs to be responsive and easy to use. It’s equally important that it not interfere with an active, everyday lifestyle. We’ve researched, ranked, and reviewed the top medical alert systems in the industry this year to determine which medical alert company we’d trust for our own families. Below you’ll find our ranking criteria, tips on what to look for in a good medical alert system, and our picks for the best medical alert systems of 2019. If we were choosing a medical alert system for ourselves or our families, we’d choose Medical Guardian. The system is affordable and easy to use, and most importantly, the customer service agents make us feel like they genuinely care. Between excellent customer service and caring, capable monitoring agents, we feel like Medical Guardian truly cares about our well-being. Excellent customer service: Medical Guardian’s customer service agents care about customers as people and not just clients, and it shows in the way they interact with you. Medical Guardian was the only company to answer all of our questions and concerns without initiating sales talk or trying to get us to speak to a sales representative. Talking to Medical Guardian’s customer service feels like talking to a relative who’s genuinely concerned for your well-being. Strong customer service helps set Medical Guardian apart and is a big reason we think it’s the best medical alert company of 2018. Easy-to-use equipment: Medical Guardian keeps its systems simple without sacrificing quality or usability. The emergency pendants and bracelets stand out because they have large, easy-to-press buttons but look similar to a digital watch and don’t attract unwanted attention. 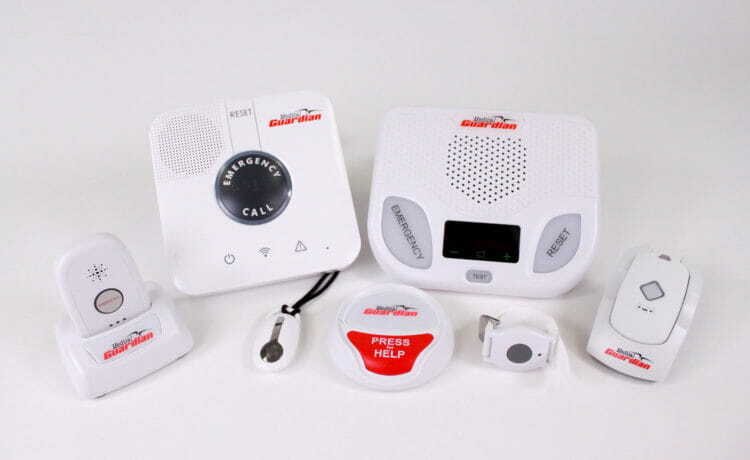 Medical Guardian also has multiple package options for you to choose from, including landline, cellular, GPS, and fall alert options. Affordable fall detection: Although it’s not the cheapest fall detection option, Medical Guardian’s $34.95 monthly price for fall detection is still one of the most affordable prices in the industry—and it’s only $5 more than the entry price ($29.95). Since we consider fall detection the most important feature in a medical alert system, it’s worth paying a little extra to couple it with Medical Guardian’s excellent customer service. Money-back guarantee: Not all companies offer a prorated refund for prepaid services, but Medical Guardian does. You can take advantage of lower monthly costs by using a prepaid discount without worrying whether you’ll get your money back if you need to cancel for any reason. Longer range from base station: Depending on your package, Medical Guardian pendants work up to 1,300 feet away from your base station device. This gives you the freedom to move about your home or yard without going beyond the range of your base station device. Only LifeFone (#2) and Bay Alarm Medical (#3) offer similar ranges. Transparent pricing: Instead of advertising the monthly rate based on the annual rate discount, Medical Guardian is honest and upfront about what the price will be if you pay month to month ($29.95). This way, the discount actually feels like a discount instead of a bait and switch. Price* $29.95/mo. $34.95/mo. $39.95/mo. $49.95/mo. In addition to the options listed in the table above, Medical Guardian also offers a Family Guardian plan for $79.95 per month. It comes with many of the same features and equipment you’d get with the other plans, but it also includes multiple activity sensors, a door sensor, and a mobile app for family members that sends alerts for activity and periods of inactivity. This plan is best suited for people who want to keep a close eye on their loved ones, even if they can’t be in the home with them. *Prices in this table are based on month-to-month payments without a prepaid discount. Medical Guardian offers discounts when you pay for your service on a quarterly or annual basis. Check out our Medical Guardian review for more details. LifeFone makes it easy to afford a medical alert system and has the lowest price of any of our top five. If you’re keeping to a budget but don’t want to compromise on fall detection, LifeFone offers fall detection as an add-on to its most affordable system, which starts at $24.95 per month. Most affordable pricing: LifeFone caters to anyone on a budget by offering the lowest entry price ($24.95) of any medical alert monitoring company on our list. You’ll have to prepay for your services for a year to guarantee that rate, but with LifeFone’s prorated refund policy, you can pay up front knowing you won’t lose money if you need to cancel your service. Lowest fall detection price: LifeFone offers an add-on fall detection pendant for $5-10 more a month. This makes LifeFone the best option if you’re looking for super affordable fall detection. Mobile app: LifeFone offers a mobile app option that turns your cellphone into a medical alert system if you don’t want to carry around a GPS device. You can choose between the Mobile Alert plan for $5.95 per month and the Family Guard plan that starts at $9.95 per month. These alternatives work great for someone constantly on the go, but keep in mind neither of these options offers any form of fall detection. For more information on LifeFone’s mobile app, click here. Longer range from base station: Like Medical Guardian, LifeFone offers a range of up to 1,300 feet from your base station device with certain packages. This range means you can go in the basement, work in the garage, or relax in the yard without going beyond your range limits. Price* $24.95/mo. $30.95/mo. $36.95/mo. $42.95/mo. Fall detection +$5/mo. +$5/mo. +$10/mo. +$5/mo. *Prices in this table are based on month-to-month payments without a prepaid discount. LifeFone offers discounts when you pay for your service on a quarterly or annual basis. Check out our LifeFone review for a more in-depth look. Bay Alarm Medical shines for its commitment to mobility. The ultra-compact and lightweight GPS medical alert system wins for the best mobile option on our list. If you’re looking for a medical alert system that won’t slow down a very active lifestyle, Bay Alarm Medical should do nicely. Longest range for entry-level package: You don’t have to decide between saving money and extending your mobility. 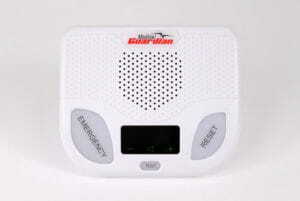 Bay Alarm Medical’s medical alert systems come standard with a 1,000-foot range from your base station. Waterproof GPS wearable: You can take your GPS device in the shower or bathtub where slippery surfaces may cause concern. GPS battery life: Bay Alarm Medical’s GPS battery life lasts for up to 72 hours per charge, which is double the battery life of its closest competitors. You won’t have to worry about your device losing power while you’re out living your life. Price* $19.95/mo. $19.95/mo. $29.95/mo. $39.95/mo. Fall detection +$9.95/mo. +$9.95/mo. No +$9.95/mo. *Prices in this table are based on month-to-month payments without a prepaid discount. Bay Alarm Medical offers discounts when you pay for your service on a quarterly or semi-annual basis. 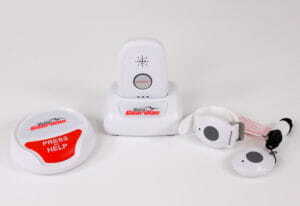 Check out our Bay Alarm Medical review for more details. Over 250,000 families have chosen Alert1 Medical Alert Systems to protect their loved ones, making it one of the most popular choices available. Alert1 keeps it simple, offering traditional landline medical alert systems, but has recently stepped up its game and added fall detection and cellular options as well. Although we love the 30-day money-back guarantee, Alert1’s no-refund policy keeps it from cracking the top three. Voice extender: Alert1 offers an add-on device called a voice extender that allows you to speak to a medical alert monitoring agent the same way you would through the base station. So if you can’t hear the base station in a certain room in your house, you can add a voice extender. It’s a nice addition, knowing you can hear and speak to a representative during an emergency, no matter which room you’re in. *Prices in this table are based on month-to-month payments without a prepaid discount. Alert1 offers discounts when you pay for your service annually. 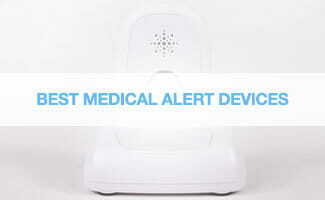 Check out our Alert1 medical alert system review for more details. Existing ADT customers or someone who craves consistency might consider ADT Medical Alert for its price-lock guarantee and low monthly monitoring costs. We really like that this system integrates with ADT’s home security system, so if you’re looking for home security on top of a medical alert device, you should consider ADT. Low monthly costs: ADT Medical alert actually beats our number-one pick, Medical Guardian, for lower entry-level pricing at $27.99 per month. Price-lock guarantee: ADT’s ForeveRate program means you can lock in your monthly monitoring price to make sure it never changes. *Prices in this table are based on month-to-month payments without a prepaid discount. ADT Medical Alert offers discounts when you pay for your service on a quarterly or annual basis. A medical alert system gives you the ability to contact family, friends, or emergency medical professionals during a medical emergency. Step 2: Speak to a trained medical alert operator to verify you need help. Step 3: The medical alert operator will alert a family member or friend, or dispatch emergency response on your behalf. Although a medical alert system will not prevent a medical emergency, it can help reduce its severity by providing immediate emergency response. Things like equipment, usability, pricing, and overall experience helped us determine which medical alert systems we’d recommend to our own family members. With them in mind, we put each medical alert system under the microscope and compared hundreds of different data points. Here’s what to look for when deciding which medical alert system will work best for your needs. In our opinion, fall detection is the single most important feature of any medical alert system. When a fall detection device triggers, it will automatically contact the medical alert monitoring station on the wearer’s behalf. More severe falls can make it so the wearer can’t press or reach the emergency help button. Fall detection provides aid in instances where the wearer may be unconscious or otherwise unable to activate their wearable device and takes the “what if I can’t call for help?” scenario out of the equation, which is why we recommend it so highly. Most medical alert systems do not offer fall detection as a standard feature, but we highly recommend spending a little extra to add this feature to your medical alert system. We’ve provided the minimum entry price for fall detection in our prices section. Most medical alert systems use the same basic setup. There’s the main console, or base station, that connects either through a landline or cellular signal. These base stations are lifelines that provide two-way communication to a medical alert monitoring center. The base station has a big emergency button and a two-way audio speaker that lets you communicate with the medical alert central monitoring center. When we say range, we’re referring to how far your wearable pendant or bracelet will work from the base station. Choose a medical alert system that allows you enough space to roam and live your life. Ranges can vary anywhere from 350 to 1,300 feet. Many medical alert systems offer both pendants and bracelets as wearable buttons that can trigger your medical alert system. We recommend using whichever is easiest and most comfortable for your lifestyle. Most fall detection devices are pendants. 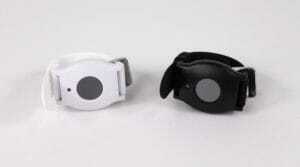 Most wearables are not equipped with two-way voice. This means you’ll have to be within vocal range of the base station or have GPS to speak with a medical alert representative. If the system triggers and the medical alert representative can’t hear you, they will automatically dispatch an emergency response team to your location. You have to stay within range of your base station or GPS device. GPS medical alert devices allow you to go anywhere you want, as long as you have a cellular signal, and they can communicate with a medical alert monitoring center when you press the button on the device itself or a wearable device. If your daily routine takes you all around the house, into the yard, or away from your home entirely, you may want to consider a GPS medical alert option. These devices work the same way as standard medical alert systems but are more compact and portable. They will easily fit inside a purse or coat pocket. Most medical alert companies offer both landline and cellular options. Landline options generally have lower monthly costs but can limit your mobility to the range of your base station device. Cellular devices allow for a wider range of use and can even function as GPS/mobile devices as long as you can get a cellular signal. On average, it takes 30 to 60 seconds from the time you press your emergency help button to get a representative on the line, ready to assist you. This response time varies between companies and even devices, but you’ll rarely wait longer than a minute. Keep in mind, the time you wait for physical help to arrive will depend on family members’, friends’, or an emergency response team’s travel times. We like to give the benefit of the doubt to any service that we review, but we do look heavily into what consumers say about the service they receive. We looked at overall comments from existing customers for each company to see whether their experiences were positive or negative. We suggest digging in to customer feedback as well as how the company responded to complaints to help guide you in your decision. So how much will a medical alert system cost? Most medical alarm companies have prepaid service agreements instead of contracted services like home security or mobile phones. If you pay for six or twelve months up front, you can get a discounted price on your medical alert monitoring service. It’s worth noting that not all medical alert companies offer refunds on prepaid services. So if you cancel for any reason (including death), you might not get your money back. We recommend choosing a company with a prorated refund policy. Most entry-level medical alert system packages do not offer fall detection. You’ll have to either pay for an add-on fall detection pendant like you do with LifeFone (+$5 per month) or step up to the next level of service. We believe that fall detection is a must for any medical alert system and highly recommend springing for the extra cost. Minimum price for fall detection $34.95/mo. $29.95/mo. $35.95/mo. $35.95/mo. $33.99/mo. System range 600 ft. 480 ft. 800 ft. 400 ft. 600 ft.
$34.95/mo. $29.95/mo. $35.95/mo. $35.95/mo. $33.99/mo. 600 ft. 480 ft. 800 ft. 400 ft. 600 ft. Very few medical alert companies lock you into contracts. Instead, they give you a discount on your monthly rate for paying up front—typically three, six, or twelve months at a time. You’ll want to double check whether the medical alert company offers a money-back guarantee or prorated refund for prepaid services—not all of them do. You won’t pay activation, installation, or cancellation fees with most medical alert companies, but keep your eye out for a few potential pricing pitfalls that can feel a lot like fees. Many companies will charge up to a $350 replacement fee if you don’t return the equipment within 30 days of cancellation. Because most medical alert companies lease their equipment, you typically won’t see any sort of equipment charge up front. However, it’s good to remember that you’re not buying this equipment and that you’ll have to return it when you cancel your service. Although it’s technically not a cancellation fee, many companies don’t offer prorated refunds for prepaid services, which can feel a lot like a fee. Think of it this way: if you cancel after six months of service but you prepaid for twelve months, you’re paying for six months of service you don’t need, and you won’t get that money back. We recommend asking the medical alert company you choose whether or not it offers prorated refunds before you prepay for your service. It could save you a lot of money in the long run. The fact that you’re even considering a medical alert system, whether for yourself or your loved one, means it’s time. Think of a medical alert system like a seat belt—99% of the time you won’t need one, but it can save your life when you do. Have I stumbled, fallen, or felt dizzy in the past year? In the past year, have I been in the hospital or the emergency room for any reason? Do I suffer from any of the following chronic ailments? Do I take any medications that could make me dizzy or drowsy? Do I rely on a cane, walker, wheelchair, etc., for day-to-day mobility? Do I need help bathing, dressing, or preparing meals? How often am I home alone? LifeStation provides free replacements and repairs to any of your equipment. With a 500-foot base station range, it’s about in the middle of its competitors. LifeStation does not charge any additional equipment or activation fees and it doesn’t lock you into a contract. At the same time, there is nothing significant that stands out about LifeStation. Life Alert is a big name in the medical alert device field, but it doesn’t offer fall detection, its website has practically no information on it, and the company charges many fees associated with its services. Life Alert seems like it might be more interested in marketing than with helping you, although it does have a good track record. GreatCall Splash is one of the least-expensive medical alert devices we reviewed. GreatCall Splash is also one of the most stylish medical alert devices. It comes standard with GPS, so it works from anywhere that service is available. However, it has a very short battery life, so there’s a risk of being without help when you need it. Doesn't cover the entire U.S.
MobileHelp is pretty straightforward in its offerings. It has a few packages available and an optional fall button that you can add on for an extra fee. It gives you a prorated refund if you pay for an annual plan and return your system early for any reason. What it really came down to was MobileHelp’s price. This company has one of the most expensive services in this review. Philips Lifeline has the normal offerings and includes a mobile/GPS app. The company offers 100 different languages so there is a good chance it will have the one you or your loved one needs. The biggest downside is the cost: the premier package from Philips Lifeline, GoSafe, is pretty expensive. What sets Rescue Alert apart is that it offers support in about 150 languages. There are no extra fees involved and you can purchase the equipment brand new or refurbished so it’s yours forever. However, Rescue Alert has a limited range of equipment and not the most impressive technology. We chose to focus on only medical alert companies available nationwide even though many regional medical alert companies have excellent reputations within the industry. You can use the same criteria we used to judge whether or not a regional medical alarm system will fit your needs. Just keep in mind that if you move outside of a company’s coverage, you’ll have to switch providers. We pride ourselves on our trustworthy, unbiased reviews. Unlike many reviews sites, we do not allow monetary affiliation or relationships with the merchants listed on this page to influence our rankings. We do work with affiliate links and partnerships, but only after we have completed an unbiased review. This means we do receive a commission when you click on a link and make a purchase (product pricing and service quality will be exactly the same for you). We appreciate your respect and understanding that this is how we can afford to do such comprehensive research that provides the highest-quality and most up-to-date information. For more details on how we complete our reviews, how we’re able to do what we do, or our integrity policies, read our review process. Do you have experience with medical alert systems? Tell us your experiences with medical alert systems. Which company did you decide to go with? Was it a good solution? Would you recommend a different company? Which is the best (or worst) in your opinion? Leave us a comment below to let us know your thoughts on medical alert systems.